To look stunning and gorgeous on prom night is a dream of every girl when she is in the high-school. This dream can’t be just fulfilled by having a pretty gown or matching sandals. Along with dress and sandals, your looks are also important. 1. 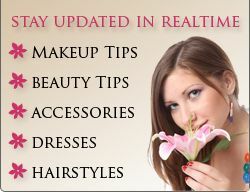 One important thing to be considered before applying makeup is that whether you want to flaunt your eyes or your lips. It is always either one. If you want to flaunt your eyes then do dark makeup on eyes and light makeup for lips and for vice-versa you will have to do light makeup on eyes and dark makeup for your lips. 2. Foundation is first thing to be considered when we start applying makeup and it is also the base of makeup. So we will have to be very careful when we choose the shade of the foundation. Apply it on cheeks, forehead and chin and everywhere on face. Whether your skin color is light or dark, you will have to choose a light shade of foundation and should go with your skin color. 3. Then we use the blusher. You can highlight your cheek by applying proper shade of blush on your cheeks. This should match with your skin tone and also with color of your dress. 4. Now move on to lips. If you want to flaunt your lips then you can go with dark colors like red or dark pink. These colors will make you look sizzling. Keep in mind your dress color and choose your lipstick color accordingly. When you use dark colored lipstick, first apply lip liner of one/two shade lighter than lipstick color and then you can apply lipstick. 5. Everyone preserves memories of prom night in one way or the other. Some keep their prom dresses or preserve the corsages or keep the photographs. So, if you want to look beautiful in photographs you should avoid using colors like brown, purple for lipstick as they will make your photographs look bad. 6. You should keep balance in color of your lipstick and the nail paint. Both should not be dark in color; always choose a light color nail polish. Like if you have applied red lipstick avoid putting on red nail paint. 7. When dealing with nails, you can either use glittering nail polish or can go with some good nail art. When preparing for prom night, you have lots of things to do. In rush of getting best dress and sandals for yourself and choosing how to look, you are intended to forget about to care for nails. In this situation you can go with acrylic nail polish as this is the best option and also in demand these days. 8. Eyes are the next, but before you apply any eyeliner or eye shadow to eyes you will have to use concealer for dark circles. It will conceal the uneven tone. 9. Then you should begin with choosing correct eye shadow and then start applying it. Then you go to eye lashes. If you want then curl them up and put liner on them. You can use artificial eye-lashes for striking effect. At last apply waterproof mascara. 10. When you want that your eyes should be revealing then try the most popular eye look i.e. smoky look. This will make you look dead gorgeous and should only be applied when your dress is bright and dark in color. Smoky eye look is very easy to put on but remember that when you are playing your eyes keep makeup of your cheek and lips very light. You can also go with cat eye look as it also makes one look cool.